No Reserve Price Auction - Watch Video of Actual Item! Clarity: VS2 - SI1. Main Stone: Genuine Enhanced Diamond. Shape: Round, Brilliant. Total Carat Weight: 1.04CT. Diamond Earrings. These diamond earrings are set with 1 carat of Princess brilliant cut diamonds mounted in 14K white or yellow gold. Setting: 14K White Gold. Diamond Pendants. Diamond Rings. Diamond Bracelets. 14K White Gold. Free certificate of authenticity included with all diamond jewelry. This is only the beginning of the story and continues by adding to the draft of the jewel, the enormous versatility involved in the actual production. 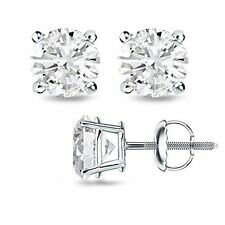 2/3 CT Elegant Princess Cut Enhanced Diamond Stud Earrings F/SI1 18K White Gold. Solitaire with Accents. Diamond Earrings. Diamond Ring Sets. Diamond Pendants. Total Carat Weight:0.6 Ct. At the Diamond Studio, we design, manufacture and craft high end diamond jewelry for over 30 years. This single stud is 1ct and full of sparkle. The diamond is genuine clarity enhanced and four prong set in solid 14k yellow gold screw back setting. Diamond Solitaire Ring. Diamond Solitaire Rings. Swarovski Pure Brilliance. Diamond Earrings. Diamond Stud Earrings 1CTW (Center Stone 0.5ct) in 14K White Gold. Each stone is hand picked and inspected making sure that it has the ultimate sparkle and brilliance. Glamorous in design, these 14k white gold basket style studs showcases two round brilliant diamonds with a total weight of 1.13 carat (approx 0.57ct each). These diamonds were graded by AGI labs as a 100% Earth Mined Diamonds, G color, SI1 clarity enhanced and Excellent Polish. To expose the true sparkle of the jewelry our goldsmith used 4-prong setting. These earring will arrive with a detailed grading certificate and with a retail value of $4,000. At Diamond BLVD, your satisfaction is guaranteed and your money is fully protected by our 30-Days 100% money back policy. Romantically brilliant, these 14k white gold classic style stud earrings showcases two round brilliant diamonds with a total weight of 1.00 carat (approx 0.50ct each). These diamonds were graded by AGI labs as a Natural Earth Mined Diamonds, F color, SI1 clarity enhanced and Ideal Symmetry. To bring out the radiance of the jewelry our master jeweller used 6-prong setting. The certificate that comes with These earring indicates the 4C's and the appraised retail value of $3,000. At Extra Brilliant, your satisfaction is guaranteed and your money is fully protected by our 30-Days 100% money back guarantee. Setting: 18k White Gold. Diamond Earrings. Diamond Pendants. Diamond Rings. Diamond Bracelets. Loose Diamonds. TYPE: DIAMOND. SHAPE: Round. Diamond Earrings. Deiamond Earrings. Why Choose Vivid Ice. 14K Yellow Gold. We buy in bulk and cut and polish our own diamonds. Clarity Enhanced. 2 x 0.55 Ct. Diamond Gemological Certificate. Hand crafted and made to order, these 14k yellow gold martini style earrings showcases two round brilliant diamonds with a total weight of 1.01 carat (approx 0.51ct each). These diamonds were certified by AGI as a 100% Natural Earth Mined Diamonds, E color, SI1 clarity enhanced, with Excellent Cut and proportions. To bring out the fire of the jewelry our diamond setter used 3-prong setting. These earring comes along with a diamond report that specify its grading and with an appraised value of $3,500. At Pelagrino & Co, your satisfaction is guaranteed and your money is fully protected by our 30-Days 100% money back policy. Undeniably elegant, these 14k yellow gold modern style studs features two round brilliant diamonds with a total weight of 1.09 carat (approx 0.55ct each). These diamonds were certified by AGI laboratories as a 100% Natural Diamonds, G color, SI1 clarity enhanced and Very Good Polish. To emphasize the true brilliance of the earrings our jewelry designer chose bezel setting. The certificate report accompanied with These earring states the characteristics of the diamond and with estimate retail value of $4,173. At Diamond Traces, your satisfaction is guaranteed and your money is fully protected by our 30-Days 100% money back guarantee. Undeniably elegant, these 14k white gold basket style stud earrings showcases two round brilliant diamonds with a total weight of 1.03 carat (approx 0.52ct each). These diamonds were certified by AGI laboratories as a 100% Natural Diamonds, E color, SI1 clarity enhanced, with Very Good Cut and proportions. To emphasize the true brilliance of the item our jewelry designer chose 4-prong setting. The certificate report accompanied with These earring states the characteristics of the diamond and with estimate retail value of $4,205. At Diamond Traces, your satisfaction is guaranteed and your money is fully protected by our 30-Days 100% money back guarantee. Beautifully hand crafted, these 14k yellow gold classic style earrings features two round brilliant diamonds with a total weight of 1.01 carat (approx 0.51ct each). These diamonds were certified by AGI laboratories as a 100% Natural Diamonds, D color, SI1 clarity enhanced and Very Good Symmetry. To emphasize the true brilliance of the jewelry our jewelry designer chose 6-prong setting. The certificate report accompanied with These earring states the characteristics of the diamond and with estimate retail value of $4,480. At Diamond Traces, your satisfaction is guaranteed and your money is fully protected by our 30-Days 100% money back guarantee. Glamorous in design, these 14k yellow gold martini style earrings showcases two round brilliant diamonds with a total weight of 1.01 carat (approx 0.51ct each). These diamonds were graded by AGI labs as a 100% Earth Mined Diamonds, G color, SI1 clarity enhanced and Excellent Symmetry. To expose the true sparkle of the earrings our goldsmith used 3-prong setting. These earring will arrive with a detailed grading certificate and with a retail value of $3,667. At Diamond BLVD, your satisfaction is guaranteed and your money is fully protected by our 30-Days 100% money back policy. A stunning 14k yellow gold classic style stud earrings features two round brilliant diamonds with a total weight of 1.13 carat (approx 0.57ct each). These diamonds were graded by AGI labs as a 100% Earth Mined Diamonds, J color, SI1 clarity enhanced and Excellent Symmetry. To expose the true sparkle of the jewelry our goldsmith used 6-prong setting. These earring will arrive with a detailed grading certificate and with a retail value of $3,714. At Diamond BLVD, your satisfaction is guaranteed and your money is fully protected by our 30-Days 100% money back policy. Undeniably elegant, these 14k yellow gold classic style earrings features two round brilliant diamonds with a total weight of 1.09 carat (approx 0.55ct each). These diamonds were certified by AGI laboratories as a 100% Natural Diamonds, I color, SI1 clarity enhanced, with Ideal Cut and proportions. To emphasize the true brilliance of the earrings our jewelry designer chose 6-prong setting. The certificate report accompanied with These earring states the characteristics of the diamond and with estimate retail value of $3,746. At Diamond Traces, your satisfaction is guaranteed and your money is fully protected by our 30-Days 100% money back guarantee. Total Carat Weight 14K White Gold. Free certificate of authenticity included with all diamond jewelry. This is only the beginning of the story and continues by adding to the draft of the jewel, the enormous versatility involved in the actual production. An elegant creation, these 14k yellow gold modern style studs showcases two round brilliant diamonds with a total weight of 1.13 carat (approx 0.57ct each). These diamonds were graded by AGI labs as a 100% Earth Mined Diamonds, H color, SI1 clarity enhanced and Excellent Polish. To expose the true sparkle of the item our goldsmith used bezel setting. These earring will arrive with a detailed grading certificate and with a retail value of $5,000. At Diamond BLVD, your satisfaction is guaranteed and your money is fully protected by our 30-Days 100% money back policy. Glamorous in design, these 14k yellow gold classic style stud earrings showcases two round brilliant diamonds with a total weight of 1.21 carat (approx 0.61ct each). These diamonds were graded by AGI labs as a 100% Earth Mined Diamonds, I color, SI1 clarity enhanced and Excellent Polish. To expose the true sparkle of the earrings our goldsmith used 6-prong setting. These earring will arrive with a detailed grading certificate and with a retail value of $3,846. At Diamond BLVD, your satisfaction is guaranteed and your money is fully protected by our 30-Days 100% money back policy. These breathtaking 14k white gold classic style stud earrings features two round brilliant diamonds with a total weight of 1.21 carat (approx 0.61ct each). These diamonds were graded by AGI laboratories as a Natural Mined Diamonds, F color, SI1 clarity enhanced, with Ideal Cut and proportions. To accentuate the glow of the item our jewelry craftsman chose 6-prong setting. These earring will comes with a 3rd party certificate and an estimate appraisal value of $4,756. At Natural Facet, your satisfaction is guaranteed and your money is fully protected by our 30-Days 100% money back guarantee. From Our exclusive Designer Collection, these 14k white gold basket style stud earrings showcases two round brilliant diamonds with a total weight of 1.16 carat (approx 0.58ct each). These diamonds were graded by AGI labs as a Natural Earth Mined Diamonds, I color, SI1 clarity enhanced and Ideal Polish. To bring out the radiance of the jewelry our master jeweller used 4-prong setting. The certificate that comes with These earring indicates the 4C's and the appraised retail value of $3,897. At Extra Brilliant, your satisfaction is guaranteed and your money is fully protected by our 30-Days 100% money back guarantee. These breathtaking 14k yellow gold basket style earrings features two round brilliant diamonds with a total weight of 1.05 carat (approx 0.53ct each). These diamonds were graded by AGI laboratories as a Natural Mined Diamonds, J color, SI1 clarity enhanced and Ideal Symmetry. To accentuate the glow of the earrings our jewelry craftsman chose 4-prong setting. These earring will comes with a 3rd party certificate and an estimate appraisal value of $3,293. At Natural Facet, your satisfaction is guaranteed and your money is fully protected by our 30-Days 100% money back guarantee. From Our exclusive Designer Collection, these 14k white gold modern style stud earrings showcases two round brilliant diamonds with a total weight of 1.08 carat (approx 0.54ct each). These diamonds were graded by AGI labs as a Natural Earth Mined Diamonds, I color, SI1 clarity enhanced, with Ideal Cut and proportions. To bring out the radiance of the item our master jeweller used bezel setting. The certificate that comes with These earring indicates the 4C's and the appraised retail value of $4,086. At Extra Brilliant, your satisfaction is guaranteed and your money is fully protected by our 30-Days 100% money back guarantee. Hand-crafted by top designers, these 14k yellow gold classic style earrings showcases two round brilliant diamonds with a total weight of 1.19 carat (approx 0.60ct each). These diamonds were graded by AGI labs as a 100% Earth Mined Diamonds, E color, SI1 clarity enhanced and Excellent Polish. To expose the true sparkle of the jewelry our goldsmith used 6-prong setting. These earring will arrive with a detailed grading certificate and with a retail value of $6,452. At Diamond BLVD, your satisfaction is guaranteed and your money is fully protected by our 30-Days 100% money back policy. Hand-crafted by top designers, these 14k yellow gold modern style stud earrings showcases two round brilliant diamonds with a total weight of 1.03 carat (approx 0.52ct each). These diamonds were graded by AGI labs as a 100% Earth Mined Diamonds, J color, SI1 clarity enhanced, with Very Good Cut and proportions. To expose the true sparkle of the item our goldsmith used bezel setting. These earring will arrive with a detailed grading certificate and with a retail value of $3,158. At Diamond BLVD, your satisfaction is guaranteed and your money is fully protected by our 30-Days 100% money back policy. Diamond Earrings. Deiamond Earrings. 14K White Gold. We buy in bulk and cut and polish our own diamonds. Why Choose Vivid Ice. Clarity Enhanced. 2 x 0.60 Ct. Every item is inspected by our expert gemologists before leaving our offices. An elegant creation, these 14k white gold martini style studs showcases two round brilliant diamonds with a total weight of 1.05 carat (approx 0.53ct each). These diamonds were graded by AGI labs as a 100% Earth Mined Diamonds, J color, SI1 clarity enhanced and Excellent Polish. To expose the true sparkle of the jewelry our goldsmith used 3-prong setting. These earring will arrive with a detailed grading certificate and with a retail value of $3,429. At Diamond BLVD, your satisfaction is guaranteed and your money is fully protected by our 30-Days 100% money back policy. These dazzling 14k yellow gold modern style earrings showcases two round brilliant diamonds with a total weight of 1.00 carat (approx 0.50ct each). These diamonds were graded by AGI labs as a Natural Earth Mined Diamonds, I color, SI1 clarity enhanced and Ideal Polish. To bring out the radiance of the item our master jeweller used bezel setting. The certificate that comes with These earring indicates the 4C's and the appraised retail value of $2,806. At Extra Brilliant, your satisfaction is guaranteed and your money is fully protected by our 30-Days 100% money back guarantee. Free certificate of authenticity included with all diamond jewelry. This is only the beginning of the story and continues by adding to the draft of the jewel, the enormous versatility involved in the actual production. The two center round brilliant diamonds weight 0.80 carat (approx 0.40ct each) and graded by AGI institute as a Natural Diamond, D color, SI1 clarity enhanced, with Excellent Cut and proportions. Appraisal: AGI. Undeniably elegant, these 14k white gold modern style studs showcases two round brilliant diamonds with a total weight of 1.13 carat (approx 0.57ct each). These diamonds were certified by AGI laboratories as a 100% Natural Diamonds, D color, SI1 clarity enhanced and Ideal Polish. To emphasize the true brilliance of the item our jewelry designer chose bezel setting. The certificate report accompanied with These earring states the characteristics of the diamond and with estimate retail value of $4,544. At Diamond Traces, your satisfaction is guaranteed and your money is fully protected by our 30-Days 100% money back guarantee. Glamorous in design, these 14k yellow gold martini style earrings showcases two round brilliant diamonds with a total weight of 1.05 carat (approx 0.53ct each). These diamonds were graded by AGI labs as a 100% Earth Mined Diamonds, D color, SI1 clarity enhanced, with Very Good Cut and proportions. To expose the true sparkle of the item our goldsmith used 3-prong setting. These earring will arrive with a detailed grading certificate and with a retail value of $4,865. At Diamond BLVD, your satisfaction is guaranteed and your money is fully protected by our 30-Days 100% money back policy.